First reviewed in 2009, Toby Alone presents the reader with a world within a world, in miniature and facing enormous problems. Enchanting, exciting and magical, Toby is a wonderfully brave, thoughtful character you won't forget. 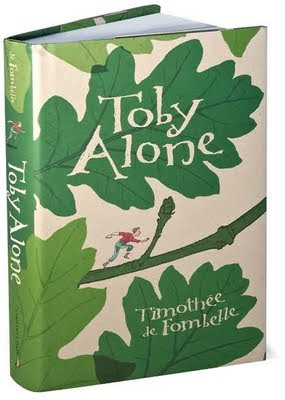 Reading Toby Alone by French playwright Timothée de Fombelle, translated by Sarah Ardizzone, winner of the Marsh Award for Children's Literature in Translation, and illustrated by François Place, is a bit like looking at an optical illusion where two different images vie for prominence - in a good way. The story of Toby Lolness, thirteen at the start of the story, and the events that cause him to run for his life are familiar and fascinating in any setting. The fact that Toby and the race of people that he comes from are on average two millimeters tall (an ant looking like an elephant next to them) and their intransigent belief that the Tree that they inhabit is the inexhaustible, indestructible singular object in in the center of the universe and all that this implies is the flip-side to the brilliant "optical illusion" that makes this book so singularly compelling. I like this life of ours, and don't especially want to change it. All I want to do is prove the Tree is a living organism. Is it right that I give everyone access to crude sap so that they can build machines that fold newspapers in four, or machines that think on their behalf? I believe that crude sap belongs to our Tree. I believe the Tree lives thanks to that sap. To use its blood would be to put our world in peril. Everybody is free to look for what I found. I won't stop anyone trying to discover the secret. But I'd rather say no more so that one day my son's son will still be able to lean against a flower or a bud. Lolness' eloquent speech sends the crowd into a frenzy, but, even worse, it stirs the slow-witted, evil-minded, corpulent mogul Joe Mitch. Mitch is the owner of Joe Mitch Arbor, the major construction and development company in the Tree, which breeds and employs deadly weevils to doze (by way of chewing and consuming) the wood of the tree in order to build what amounts to tenement housing and dangerous tunnels through the trunk and branches of the Tree. The Lolness' are exiled to the Low Branches and, despite the damp and gloom, live there happily for six years. Among other interesting characters, Toby meets Elisha and her mother Isha Lee, and they become constant outdoor companions, Elisha teaching Toby about life in the Low Branches. When Toby's maternal grandmother, the extremely wealthy and equally miserly and mean Radegonde Alnorell, dies, his mother insists on returning to the Heights for her funeral. It is this return that ultimately brings about the downfall and possibly even death of the Lolness family. As Sim foresaw, the Treetop has become a different place in the six years since they left. The excessive expansion and rapid construction has left its dire mark and it looks as "worm-ridden as a waffle." They find the people changed as well. In his efforts to control and consume the Tree, Joe Mitch has stirred up a fear and hatred for the rarely encountered Grass People who live on the ground at the base of the tree. The famous explorer, El Blue, Sim's childhood friend and the father of Leo, Toby's closest friend during his first seven years living in the Heights (the boys were often referred to as Tobyleo) disappeared in the Grasslands and Joe Mitch has utilizes this to foment fear and hatred for these mysterious "others." The intricacies of Toby's escape and the many almost Roald Dahl-ish baddies (Joe Mitch and his men have nothing on the farmers Boggus, Bunce and Bean from The Fantastic Mr Fox, characters who still creep me out to this day) who chase him with the hopes of winning the million dollar reward for his capture drive the plot while Toby's reminiscences and thoughts create welcome pauses. Timothée de Fombelle clearly has an intimate knowledge of trees and this gives his writing an intense sense of immediacy and his descriptions a vivid reality. I felt like I was walking along a branch or grinding a leaf to make leaf flower right along with Toby and the other characters. De Fombelle's imaginative uses for the various attributes of the tree by its miniscule inhabitants was also a constant source of wonder for me. I found myself looking at the liquid amber tree in my yard differently as I read this book, trying to envision little humans living in its bark and branches. François Place's illustrations are perfectly suited to the complexities of the plot and ably give shape to Joe Mitch and the other antagonists in the book, so much so that I was reminded of the work of Quentin Blake, Roald Dahl's illustrator. With his marvelous new book, Timothée de Fombelle does exactly this. He makes a tree the living center of the universe for the reader and, through his magnificent writing, enhances a sense of wonder. With his subdued environmental themes, as well as the portrayal of nurturing, empathetic relationships among characters, he encourages a respect for life. As Toby thinks to himself on day three of being snowed in (for what turns out to be over 120 days) while he is going over his provisions and figuring out how he will survive, "What was he missing? What keeps us alive more than anything else? Other people. This was the conclusion he reached. Other people." This book is not to be missed, for all readers - child and adult, fantasy and reality lovers. It would make a wonderful read aloud as de Fombelle's language is frequently beautiful even though the events of the plot can be harsh at times. Interestingly enough, I finished reading another book by a French author the same week I finished Toby Alone. Muriel Barbery's The Elegance of the Hedgehog, although it is not a fantasy and has no environmental themes, does manage to examine the complexities of human nature while exploring the wonders and riches that art, in any form - literature, painting, sculpture, film, food - bring to the human existence and life in general. I may be grasping at straws to link these two, but I did feel that both books brought important ideas and images to the forefront of my mind in ways that other books have not. For those of you who purchase this book in hardcover, a real treat is in store. 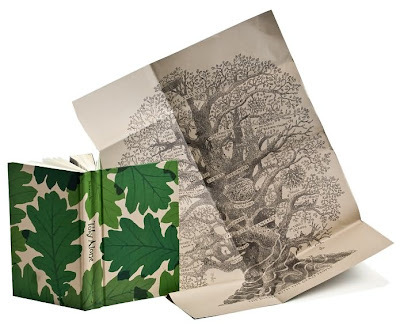 The dust jacket unfolds and expands to reveal a beautiful map of the tree! And, for those of you who read or listen to the book, another, even better treat awaits you... 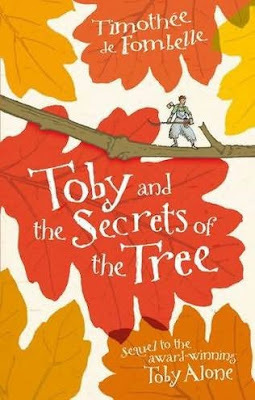 The sequel, Toby and the Secrets of the Tree, is due out in August of 2010. This sounds wonderful. I'm adding it to my wish list! Thanks for yet another wonderful recommendation. I asked our library to buy it, and Ivy just finished it -- now she's dying to get her hands on the sequel! I can't wait for the sequel either! Was the library copy at hardcover, and if yes, were you able to look at the great illustration of the tree on the inside? So glad to hear Ivy liked the book - I still think about it often. It's kind of a hard sell at the bookstore, though. It's so different and hard to get all the details into a quick verbal synopsis. One of the lucky librarians must have claimed the illustration -- might be a good reason to buy a copy. I'm not surprised that it is hard to sell. It sat in our library box for two weeks and I had to suggest it several times before she'd dig into it. I have just bought the paperback and I want the hardback now! How intense is the action? This sounds like a wonderful book! I am recommending some titles for some of the advanced readers in my daughter's third grade class. The school has an environmental science focus, so this would be a wonderful choice in that respect. @Spruiter - It's been years since I read TOBY ALONE, but, if I remember correctly, the most intense action involves Toby escaping the bad guys, being imprisoned and escaping his jail cell. Nothing graphic described in the book, but, for sensitive kids, the flight scenes might make them anxious. I think TOBY is a great recommendation for 3rd graders reading at an advanced level. Thanks! We continue to love your blog - and am revisiting a lot of your suggestions as my younger daughter is starting to read independently too! That's so great to hear! Thanks so much for continuing to read my reviews and the books!